It's no secret that Twitter for iPhone (née Tweetie) is often regarded as the gold standard for mobile apps -- it blends functionality, performance, and usability together with a dash of playful quirkiness that works so well Twitter just bought the app and hired developer Loren Brichter back in April. That delayed the release of an iPad version, but Twitter's finally come through -- and as you'd expect, Twitter for iPad does things just as uniquely as its sister apps on the iPhone and Mac. In fact, we'd go so far as to say a few of its interface conventions will become as commonplace as slide-to-refresh, which was first introduced in Tweetie for iPhone -- but let's not get ahead of ourselves. Read on for more! Innovative sliding panels UIMultiple accounts supportFree! At its most basic level, Twitter for iPad looks and works just like a Tweetie on the Mac: there's a left column where you can select between your timeline, replies, lists, messages, your profile, and search, and a main display that shows whatever you've selected. Pinching out on an individual tweet opens a floating profile view, which is extremely cool -- pinching it closed sends it away. Swiping down with two fingers shows the entire conversation, which is also extremely slick. At the bottom you've got a settings button and a new tweet button that slides the entire interface down to reveal a notepad-styled compose window -- another interface idea we think others will pick up on quickly. As with any good Twitter client, you can attach photos, geotag your tweet, and shrink URLS. 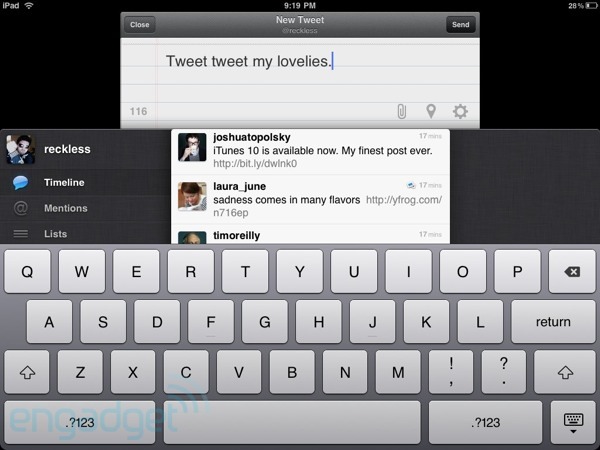 Twitter's sliding panels UI is definitely one of the most unique and usable iPad interface concepts we've ever seen, and we're pretty sure it'll be aped by all sort of other apps in the near future -- and just like pull-to-refresh, there are going to be good implementations and complete catastrophes. Indeed, even Twitter's implementation can get a little cluttered and chaotic. 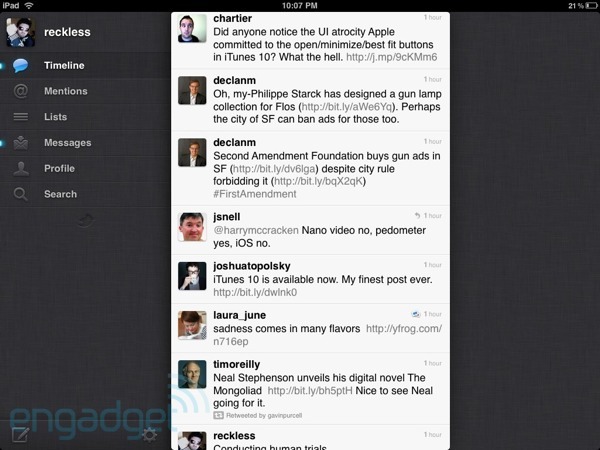 But it's nice to see Twitter and Loren Brichter have carried on Tweetie's legacy of UI innovation with Twitter for iPad -- and that they're doing it in a great free app makes it even better. We're told it should start appearing in the App Store now, so go grab it.